The Ofyr cone-shaped grill is designed for healthy outdoor cooking and grilling. 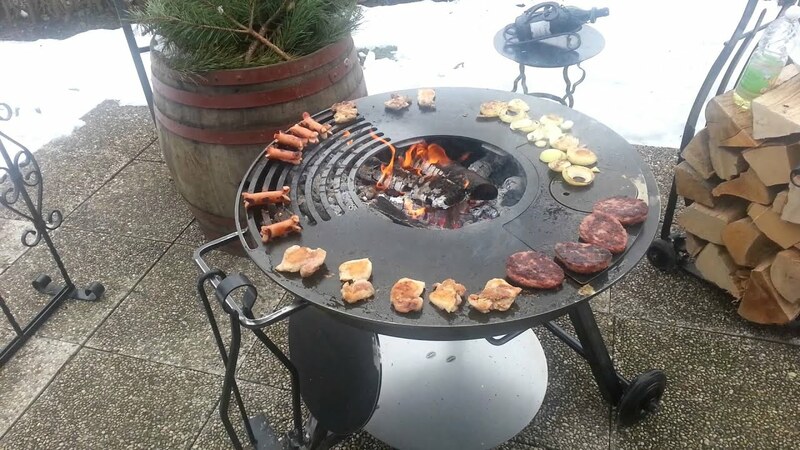 This fire pit style grill can be transported to the beach, backyard, or another home for cookouts. It is made of three parts which makes it easy to move from one location to another. This grill has a cone-shaped bowl and flat round surface that is easy to cook on. The best fuel to use with this grill is wood. It can burn any kind of wood. Some customers use oak, pear, or cherry wood. The heat comes from the center of the fire pit providing a wide range of cooking temperatures. This grill is made in the Netherlands with quality materials. It can be left outdoors and covered in bad weather. It lasts for years and looks good on the patio, in the backyard or garden. It is made of corten steel and black carbon steel. When barbecuing, a small bag of logs will be enough for a barbecue or cookout. When you add logs or wood the first time, its start with a small fire and let it burn 20 to 25 minutes. Add more fuel slowly as this allows the cooking plate to change shape gradually. The inner and outer edges of the cooking plate heat up at different rates. When cooking on the flat plate its best to use oil with a high smoke rate. Oils that are recommended are the sunflower, olive oil or grapeseed. Allow about 45 minutes for the plate to heat before cooking meat, vegetables, fish, or poultry on it. One way to start is to put logs two at the time in fire pit facing outward building about five layers. Put firelighter in the middle and light them with a match. Use oak, beech or other dried wood or logs. Oil the plate with olive oil several times to keep it clean and working well. When finished grilling let the fire burn out or cover it with the plate. To put it out quickly pour water over the cone. There will be smoke and ash from this. Wipe it off with the damp cloth and remove food with a spatula. Add oil frequently to the plate. Caring for the grill to keep it working properly is important. Using healthy grilling techniques improves the chances of cooking healthier food and enjoying the grilled food more because of your practicing healthy grilling techniques. Marinating meats before cooking helps to reduce carcinogens by about 57 to 88% according to Cooking Light. Keep the grill surface clean helps to promote healthy grilling on the ofyr cooking grill. Grill leans cuts of meat, poultry, and fish with less fat for healthier grilling Cook burgers to 160 degrees to kill any bacteria. Cutting or slicing meats reduces cooking times. Some of the best meats to grill are pork tenderloin, flank steak, swordfish, skinless chicken, veal, buffalo burgers, and turkey burgers. Vegetables that grill well is corn on the cob, asparagus, zucchini, peppers, onions, mushrooms, and entertainment. A grill will provide year-round opportunity to eat delicious food.